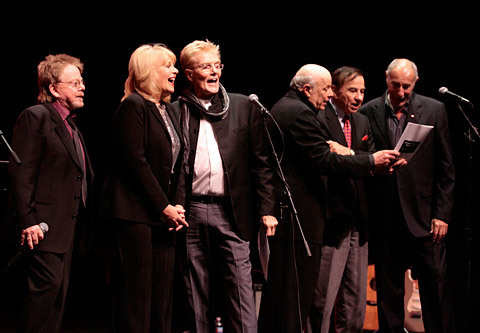 (Left to right) Paul Williams, Ilene Graff, Bob Crewe, Charles Fox, Richard Sherman and Jeff Barry sing Crewe's hit "Can't Take My Eyes Off Of You." LOS ANGELES—An all-star cast of songwriters performing their hits – many of them written for films and TV – raised more than $200,000 for the pro-education Fulfillment Fund at a benefit concert Monday, June 1, at the Wadsworth Theatre in West Los Angeles. 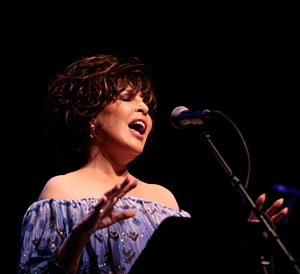 A capacity crowd of more than 900 watched as songwriters David Foster, Carole Bayer Sager, Richard Sherman, Kenny Loggins, Paul Williams, Jeff Barry, Charles Fox and Bob Crewe sang "The Songs of Our Lives," as the program was called. This was the second annual event, produced by Fox and directed by Joel Zwick, to raise money for the program that mentors and counsels disadvantaged young people and makes it possible for them to attend college. Actor-singers Jason Alexander and Ilene Graff opened the three-hour show with a rendition of "They're Playing Our Song," the title tune of the Marvin Hamlisch-Carole Bayer Sager Broadway smash of 1979. 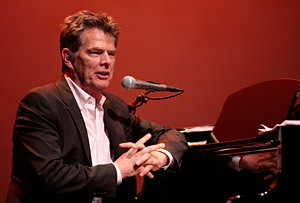 Foster, at the piano, performed a funny series of medleys arranged in order of the three ex-wives who effectively took half of all his royalties in each divorce. Songs included "After the Love Is Gone" (first wife), "The Glory of Love" (second) from The Karate Kid, Part II and the love theme from St. Elmo's Fire (third). He also introduced his latest protégé, 16-year-old Filipino singing sensation Charice (who sang "I Have Nothing" from The Bodyguard); she was joined by another Foster protégé, Cody Karey, for a duet on Foster's Oscar-nominated song, "The Prayer" from Quest for Camelot. Sager did a 20-minute set that included a remarkable number of familiar tunes including "Groovy Kind of Love," "Don't Cry Out Loud," "Nobody Does It Better" from The Spy Who Loved Me, her Oscar-winning theme from the movie Arthur, "Midnight Blue," "Heartlight," "They're Playing Our Song" and her HIV-AIDS benefit anthem "That's What Friends Are For." Sherman – who with his brother Robert penned dozens of songs for Walt Disney movies and TV shows – performed a suite from their Oscar-winning score for Mary Poppins (including "A Spoonful of Sugar," "Chim-Chim-Cheree" and Disney's favorite "Feed the Birds") as well as title songs from the Winnie the Pooh film series, Chitty Chitty Bang Bang and others. He surprised the crowd performing his Disneyland favorite "It's a Small World" at a much slower tempo than usual and explained its origins as a "prayer for peace." 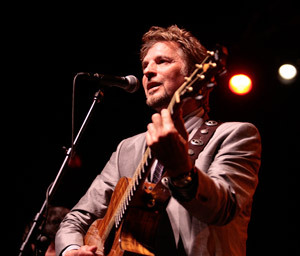 Loggins, on the guitar and joined by another guitarist and bassist, played "I'm Alright" from Caddyshack and his environmental anthem "Conviction of the Heart" as well as "Return to Pooh Corner." He was followed by Williams, who sang "I Won't Last a Day Without You," "Rainy Days and Mondays," his Oscar-nominated Muppet Movie song "The Rainbow Connection" and two songs written with Fox: the theme from TV's The Love Boat and "My Fair Share" from the basketball movie One on One. Fox, the driving force behind these events, played "Ready to Take a Chance Again" from Foul Play and the Jim Croce classic "I Got a Name," written for The Last American Hero but which Lena Horne also adopted for her Broadway show years later. Crewe brought down the house with a finale that had him singing many of his 1960s and '70s hits, among them "Can't Take My Eyes Off of You," "My Eyes Adored You," "Big Girls Don't Cry," "Walk Like a Man" and "Lady Marmalade." Fox returned to the stage to talk briefly about the Fund, which helps an estimated 2,000 students a year through mentoring, classroom instruction, college counseling and scholarships. The organization works to motivate students to overcome barriers, graduate from high school and attend college. Fox and his wife Joan were surprised by the news that a new Joan and Charles Fox Scholarship would be added to the awards distributed annually by the fund. More information is available at www.fulfillment.org.